Mumbai: Yes. Dreams do come true. It was Afghan girl Shakila Zareen's dream to meet Bollywood superstar Salman Khan someday. After all, she loves him! In India to reconstruct a once-beautiful face left badly-disfigured by a gun-toting, cruel husband, Shakila met her heartthrob today in Mumbai. And imagine her joy when Salman Khan confided that his ancestors too fled Afghanistan six generations ago for the very same reason she is in India -- lawlessness. "And it's still the same. They follow Islam, they say. But they don't follow any religion. All they believe is in dominating women, unlike Islam which talks so much about woman power and their rights," Salman Khan gently told Shakila, after hearing her desperate story of abuse that hopefully will find answers here. And, in this case, Deccan Chronicle was only too happy to be the dream merchant! With loads of help, of course, from actor Salman Khan's father, the very dear Salim Khan. We flew her down to Mumbai from Delhi where she is being treated by doctors at the Apollo Hospital. Eighteen-year-old Shakila Zareen was born to poor parents. They married her off last year to a 31-year-old cousin, but succour soon turned to despair when the abuse started -- from her husband and his family. Last December, she was shot by a hunting gun at her parents home. 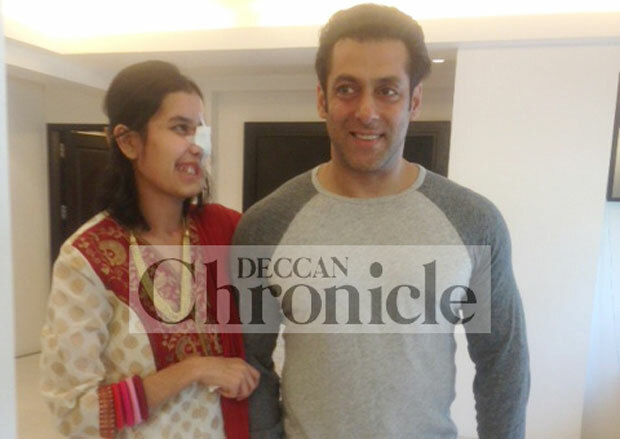 A face with a gaping hole, nine surgeries and all hope lost for a blinded eye, Shakila slowly told her story to Salman at his Galaxy Apartment in the afternoon today. "Salam alaiqum," Salman Khan greeted a very nervous Shakila at his home. "I have watched all your movies and really like you," was her shy response to his: "Kaisi hai aap?" small note that said: “Thank you for making my dream come true”. Salman also spoke to Shakila’s doctor at Apollo to get some details about her treatment, and to ask if he could be of any help. Dr Shahin Nooreyezdan, Apollo’s senior consultant (plastic and cosmetic surgery), also tried to help Shakila meet the man of her dreams. “Since she used to talk so much about Salman. I put her picture on my Facebook (page) asking all my friends if they could help her meet Salman. I am so happy she has met him”. She has been nervous from the moment she stepped out of a Delhi guesthouse at 4 am today morning to catch the flight. It was her first trip to Mumbai. "I could not stop thinking about him last night," she said giggling, wondering what she would tell him. She has also been bought a new suit for the occasion. She has only two more. But not any more. Shakila flew back from Mumbai with lovely gifts from Salman. Some nice suits, shoes, bags — she got them all. “You are a lovely human being,” said Shakila. Shakila is desperate to stay on in India to get her face reconstructed. The bullet that tore into her face blew out her nose, an eye and impaired hearing in the left ear. It also destroyed teeth and the nose cartilage. She’s unable to speak properly. And her face, reconstructed partially from her thigh skin, is still swathed in bandages. She is now discharged from Apollo, but returns frequently to change the gauzes. And she deals with her trauma with hope. She is afraid to go back to Afghanistan, says Shakila to us, "my husband will kill me". And she wants to be beautiful again, and then perhaps America where she wants to study. "Main bahut sundar thhi. Dekho kya kiya usney," she had told Deccan Chronicle when we reported her wish to meet Salman. She wants to be a journalist, Shakila Zareen. To be a voice for distressed women, to get them justice. Reluctant to return to New Delhi from Mumbai, Shakila left Galaxy Apartments promising Salman that she would come back and meet him soon — the day she gets back her beautiful looks!